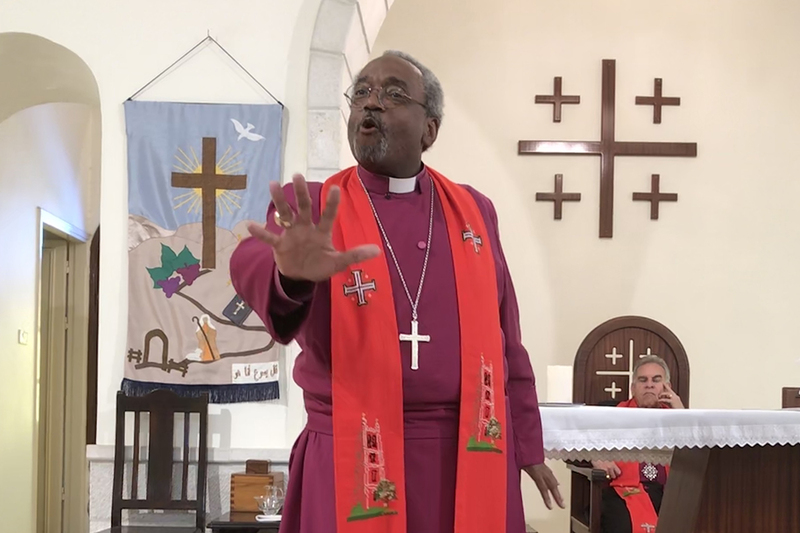 [Episcopal News Service – Jerusalem] On Maundy Thursday afternoon, Presiding Bishop Michael Curry reflected on what he has seen and heard since arriving in the Holy Land March 23 to make a Holy Week pilgrimage. In the week that we’ve been here, we have spent time, and some of it in depth, with Archbishop Suheil and our Anglican brothers and sisters. In the course of our time we have seen and visited holy places where our Lord Jesus was born in Bethlehem, raised in Nazareth, spoke Beatitudes on the hills of Galilee and then entered Jerusalem in a procession that proclaimed that God has a better way for humanity than the way of power politics and greed and hatred. And we have walked the streets of Jerusalem where Jesus was unjustly arrested, tortured and killed – the streets where he willingly sacrificed his life for the cause of God’s love, which ultimately is the only hope for us all. As we have seen the places of his suffering, we have seen the suffering of the children of God today. We heard the cries of Christian refugees from Iraq, people who have lost virtually everything save their own lives, mainly because they are followers of Jesus. We have heard the cries of people in Gaza, where the church here provides an oasis in a hospital, and oasis in the midst of a war zone through a hospital built on the teachings and spirit of Jesus, where healing and care is made available to all regardless of religion, regardless of ethnicity, regardless of politics. We have heard the cries of Palestinian Christians throughout the land, who thrive only for equal treatment and kindness and justice for all regardless of race or religion. We have heard the cries of people in Palestine in the West Bank where the Diocese of Jerusalem is present in St. Luke’s Hospital and its clinic and its churches. Following the teachings of Jesus again, no one is turned away because of inability to pay or because of religion or politics or ethnicity. We have heard the cries of the Palestinian people in Jerusalem who yearn as all people yearn to breathe free in true human equality. We have heard the cries of Israeli youths whose longings are the same, to breathe free, safe and secure. We will visit Yad Vashem, where the end result of hatred and bigotry and inequality and injustice is there for all to see. Jesus sacrificed his life to save us from the sins and arrogance and indifference and injustice, bigotry, hatred; he came to show us the way, to be saved from the human nightmare. As we pray for the peace of Jerusalem, as the Bible teaches us, we must find ways to work for the peace of Jerusalem, which will be found where there is true equality for all, true justice for all and true freedom for everyone. Here it is clear that this is not simply an idealistic dream. It is the only hope, and we must not rest until it is realized. Thanks much to Bishop Curry for his telling remarks while in the Holy City. I made a pilgrimmage to the Tent of Nations southwest of Bethlehem in May 2016 and learned that all the followers of Christ in the Holy Land need to speak with one voice to the desperate needs of the Palestinian people, and to stand with them for justice and peace in the continuing times of violence and hatred. Thank you Presiding Bishop Michael, for carrying the cross. Hoping and praying that brings healing to the Palestinian and for all that needs healing that we may focus on God’s Love always in us all be manifested. Through Jesus Christ our Lord. Amen.